(CNN) -- Malawi's high court ruled in favor of pop superstar Madonna on Friday, saying she will be able to adopt a young girl from the country, said Zione Ntaba, a spokeswoman for the attorney general's office. "In our judgment," the court wrote in its ruling, "the welfare of infant CJ will be better taken care of by having her adopted by the foreign parent rather than for her to grow up in an orphanage where she will have no family life, no love and affection of parents." Madonna issued a statement saying she is "extremely grateful for the Supreme Court's ruling on my application to adopt Mercy James. I am ecstatic. ... My family and I look forward to sharing our lives with her." The young girl at the center of the current case is Chifundo James, whose first name translates to "mercy" in Chichewa, Malawi's national language. Madonna, 50, took her effort to adopt the three-year-old to Malawi's highest court last month after a lower court ruled the adoption did not meet local law. Malawi requires applicants for adoption to have lived in the country for 18 months before they may be granted permission. 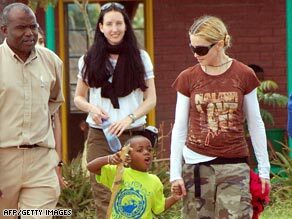 That condition was waived in 2006, when Madonna adopted another Malawian child, David Banda. Madonna has two other children who are not adopted. Mercy has lived in an orphanage for most of her life; her teenage mother died shortly after childbirth. Meanwhile, child rights group Eye of the Child told CNN it agrees with Friday's high court ruling. The group had earlier opposed the adoption. "There was legal confusion about this case," said Maxwell Matewere, executive director of Eye of the Child. "We are happy that the high court is able now to give us direction. This provides an important precedent." But the man believed to be the father of Chifundo told CBS's "The Early Show" that he did not want Madonna to adopt the young girl. "I'm crying. I need my baby," James Kambewa said. "I don't know where I can find any help." Kambewa told CBS that he wants to raise the child. "I do not want my baby to be adopted because I want to take care of her and I'm capable to take care of my baby. ... Mercy, she is a Malawian -- so (I) need her to grow as a Malawian, as well with our culture." The court said it does not know who the girl's father is. Madonna's long-term charitable involvement in the country was considered when the court decided in her favor, according to the judgment. Madonna has been involved with Malawi for several years and made a documentary, "I Am Because We Are," to highlight the poverty, AIDS and other diseases devastating children in the country. She also co-founded a nonprofit group, Raising Malawi, that provides programs to help the needy. CNN's David McKenzie contributed to this story.